When it comes to sharing a vidscrip, you've got options! 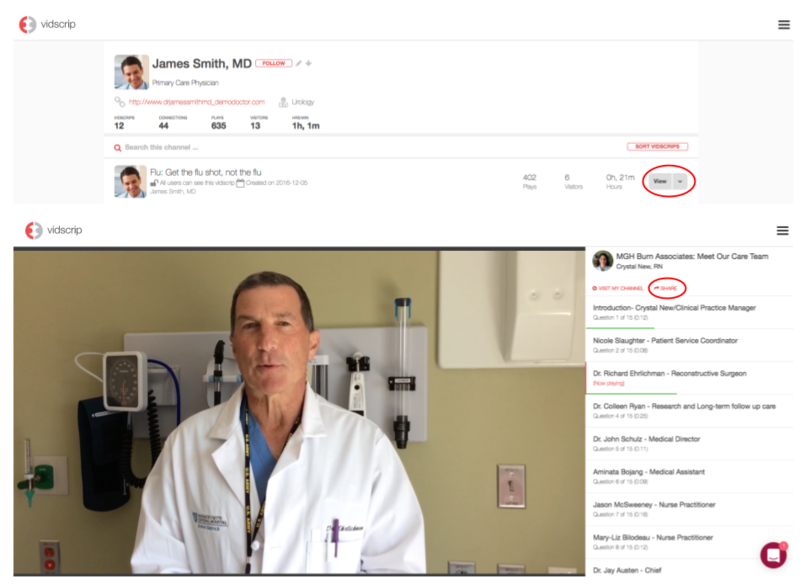 You can share public vidscrips with your connections, on social media, or directly to an email address or mobile number. Private or network-only vidscrips can only be shared with your connections. *Note: You may be prompted to revise the privacy settings of your vidscrip if it is still set to Private or Only Me. Your ability to share someone else's vidscrip will depend on the privacy setting they’ve specified. Choose from a number of Direct sharing options, which on the web allows you to share a vidscrip that plays from any point (beginning, chapter, or question). Select the people you’d like to send the vidscrip to, and click "Finished"
Enter all the emails you wish to send to and click "Finished"
Enter in all the mobile numbers that you wish to send to and click "Finished"
You can also encourage patients to download the app, create an account and follow you on vidscrip - this will allow you to share private vidscrips as well. On the web, you can also grab a snippet of code to use to embed your vidscrips directly on your website. Check out this article for more information. *Note: you’ll need to make sure the vidscrip’s privacy settings match who you want to share with. See the article on "Changing your vidscrip's Privacy Settings" for more details.